The Airton mill was originally the site of a corn mill owned by Bolton Abbey and was part of the Manor of Calton. After the Dissolution, the Manor passed into the hands of the Lambert family and finally to Sir John Middleton of Belsay Castle, Northumberland on his marriage to Francis Lambert in 1699. When he died, the estate was heavily mortgaged and his son put it up for sale. The old corn mill was bought by William Alcock, the Skipton banker, in 1785, and he sold an interest in the mill to Margaret Williams, a widow of Kirkby Malham, her son John Hartley of Airton, John Brown of Calton and several others. The corn mill was then used by John Brown for cotton spinning about 1786, though the partners agreed to maintain the existing corn milling. These premises are now in the pofsesion of the said Margaret Williams and others her co-partners in the Businefs of Spinning Cotton Twist their asigns and others her undertennants together with all and singular Roads Ways. Paths pafsages waters watercourses mill dams mill goits wears pools and streams of water waste grounds easements rights privilages advantages emoluments heriditaments and appertinments . . . . . to the said mill . . . . . and one sixth part of one drying kiln belonging in any wise appertaining . . . . . Proviso that the said Margaret Williams and others the owners of the said mill or any parts or shares thereof for the time being should at all times therafter use a sufficient part thereof as a Water Corn Mill for the purposes of grinding at all seasonal times when required, upon the usual mulcture being rendered and paid, all the corn and grain which should be brought to the said mill to be ground belonging to the inhabitants of the Parish of Kirkby Malham aforesaid or such of them who have aright to have corn ground there according to immemorial usage and should the owners of the said mill refuse or neglect or grind such corn as aforesaid it should be lawful for the said William Alcock to enter the said premises to have the same again. 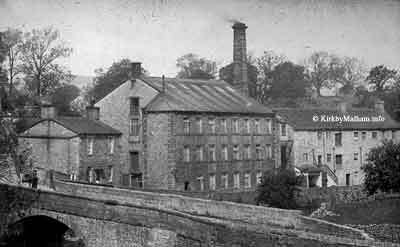 Around 1787 the partners bought the rest of the holding from Wm Alcock and by 1789 the partners had built a new "Arkwright" style mill alongside the old corn mill especially for cotton spinning, which you can see on the right hand side of the photograph above. This was taken by Robert Thornton, who joined a partnership at Castle Mill in Knaresborough that year, but continued cotton spinning at Airton Mill until 1795 when he was bankrupt. The cotton spinning machinery used by Thornton was then put up for sale and it included six carding engines, two drawing frames, two roving frames and six spinning frames with forty-eight spindles each. 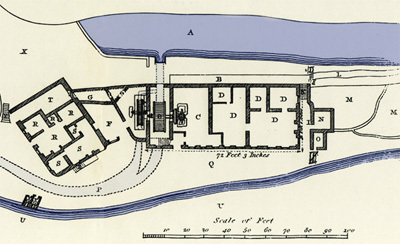 Plan of the 1789 cotton mill about 1818, after the new weir and wheel were added. In 1797 the mill was owned by John Williams of Dartford in Kent, who was Margaret Williams' son-in-law, and John Hartley of Airton while the firm leasing the mill was Hartley, Maher & Co. The mill and machinery were insured for £1,000 while Hartley & Maher insured their stock for £500.
. . . situate on the Western side of the River Aire in Scosthrop aforesaid along the banks thereof by extension, 2 acres 36½ poles of customary measure more or less, the length thereof is 294 yards, for the purpose of cutting away the said land and making a pond, race, or reservoir for water to run or flow from a place near the footbridge lying across the River Aire in Scosthrop to the commencement and as far as the ancient race nearly opposite the ancient tumbling bay or dam stakes of the said John Williams in the Township of Airton in the Parish of Kirkby Malhamdale and which cut hath been since made and bounded off and is to be made use of for supplying the said mill with water from henceforth during the time hereby granted and also all the land or ground of him the said Josias Rimmington situate along the Western side of the old and ancient millrace commencing at die place where the before mentioned cut or race terminated and nearly opposite the tumbling bay or dam stakes into the said River Aire . . . . . . . . for the purpose of erecting a trench or trough to carry the said water from the place where the said cut above mentioned terminated to supply the said mill and to make an overshot wheel and the same is begun to be prepared for that purpose and the land or ground . . . . . granted is tamped or marked out together with the full and free right and liberty of drawing the water from the River Aire into the said cut or reservoir . . . In 1817 there was a crisis in the Greenwood & Ellis family businesses and all their properties and leases were for sale, the sale details provide a good idea of the scale of the operation. LOT 2 : At Airton and Scosthrop in the Parish of Kirkby Malhamdale in the West Riding of the County of York. All the beneficial interest in a lease for years granted by John Williams, Esq., at the reserved yearly rent of £113 and expiring in 1834, of a substantial stone built cotton mill at Airton seventy two feet three inches long and thirty one feet wide the mill contains one water wheel twelve feet diameter three feet broad, which, with the tumbling shafts belong to the landlord at the expiration of the lease. The remainder of the machinery is the property of the leasers and consists of a water wheel sixteen feet diameter and six feet broad with the heavy gear belonging thereto. Also one picking engine, five breakers thirty six inches each, five cleaners, also of thirty six inches each, with one grinding engine, eight heads of drawing, one slabbing frame containing fourteen spindles. Three roving frames seventeen spinning frames containing one thousand six hundred and thirty two spindles, one hydro static bundling press, four reels of four hundred and thirty two spindles, three warping mills, one winding engine of one hundred and thirty spindles, with cans, scales, weights, baskets, bobbins etc. Also a blacksmith and carpenters shops and also all necessary tools for carrying on the cotton spinning business. 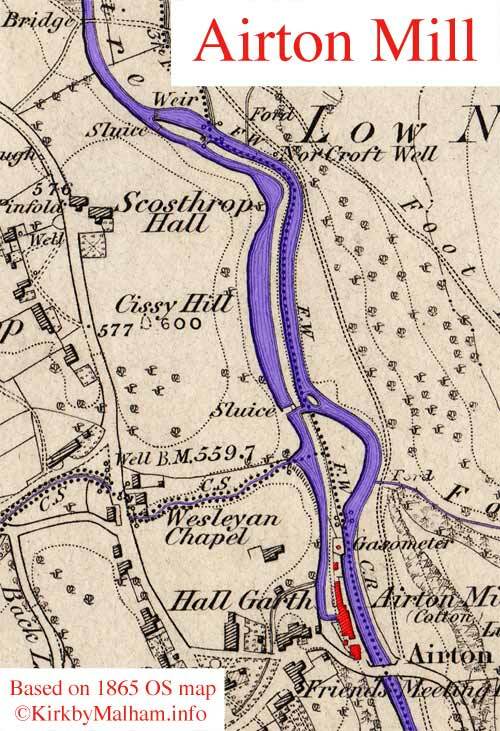 Also three cottages adjoining the mill and four other cottages and gardens at Hallgarth, also four cottages situate at Scosthrop both of which places are near the mill and are now occupied principally by the workmen at the mill. Also the beneficial interest in a messuage or dwelling house with stable and gardens for a term of years granted by Mr. Anthony Taylor at the reserved rent of £7 10s and expiring in 1834. At the time the lease of the mill was granted by Mr. Williarns the fall of the mill was only from eight to nine feet; that fall has been increased to sixteen feet, by the wear having been made higher up the river. Airton is situate within three miles of the Leeds and Liverpool canal and is distant seven miles from Skipton, forty from Manchester and seventy seven from Liverpool. To be viewed on application to Mr. Williarn Smith on the premises. 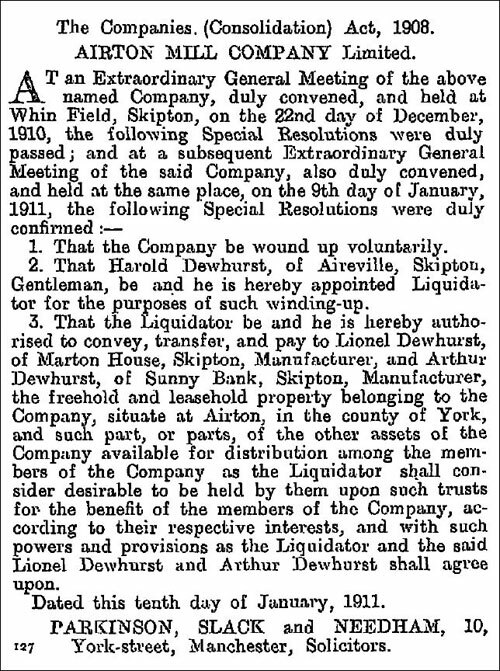 In 1819 John Greenwood bought the lease and properties of the Airton part of the business for £900 plus a further £200 for stock and work in progress. In 1825 John Greenwood & Co sold the remainder of the lease and all the equipment to Isaac and John Dewhurst of Skipton and Embsay. When the lease ran out in 1834, the Dewhursts and partners purchased the freehold from the Williams estate. They had big plans for the business and the "New Mill", shown on the left of the first picture, was begun about 1836 and completed in 1839. The enlarged business used a combination of water and steam power for the machinery and a gas plant to supply the lighting. An entry in the diary of Robert Kidd Richardson (1853-1938) who worked all of his life at the mill from 1871, finally becoming manager when his brother John retired, gives some idea of the wages earned in the mills. Written in 1888 it records that around 1850 Airton mill employed almost 50 staff, working a 60 hour week, and the weekly wage they were paid. The occupations indicate that only spinning was undertaken here. 3 overlookers; 1 scutcher; 2 carders, 9 spinners; 4 doffers; 2 rovers; 2 doublers; 3 winders; 3 warpers; 1 bobbin piler and an engineer. Read more about the Processes and Jobs in the Malhamdale cotton spinning mills. Dewhursts ran the business in conjunction with their Skipton mills and continued to run the mill until they became part of The English Sewing Cotton Company, where a non-competition agreement effectively prevented them from producing yarn there for the next 14 years, so the the mill ceased production in 1904 and its assets were then passed to the The Airton Mill Company. The Memorandum of Association for the company, registered 6 Oct 1904 stated that it was to take the mill on as a going concern for cotton spinning, winding, reeling, warping and beaming, though it is not clear that it ever did produce anything and the company was wound up in 1911. The mill had its own coal gas production and storage facility and one of their intentions was to manufacture gas and to supply and sell this for heating and lighting purposes, presumably carrying on the existing supplies to the village. Interestingly they also said they were going to generate electricity for lighting, heating and motive power, though apparently it was their successors the Airton Engineering Company who eventually did this as the 1910 advertisement for the mill doesn't mention any electric plant. The head race at Airton Mill, where it enters the building. TO BE SOLD or LET, AIRTON MILL, Airton, Yorkshire, situate about two miles from Bell Busk Station (Midland Railway) and eight miles from Skipton, with excellent water and steam power, gearing, shafting, gas-making plant, &c., as recently occupied for cotton spinning. The main mill is 31/2 storeys, 64ft. long by 45ft. wide, and there are several other buildings of one, two, and three storeys, forming boiler and engine houses, &c. Full particulars may be had from RUSHTON, SON and KENYON, auctioneers, valuers and fire loss assessors, 13, Norfolk Street, Manchester. 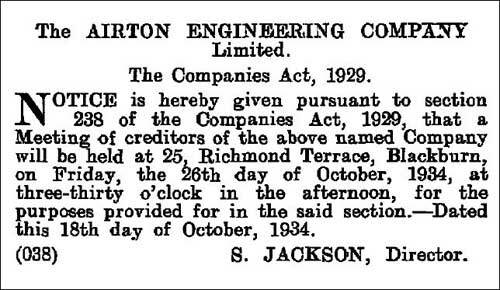 In 1918 the mill was sold to AE Jackson of Blackburn who started a sheet metal and general engineering business known as the Airton Engineering Company. 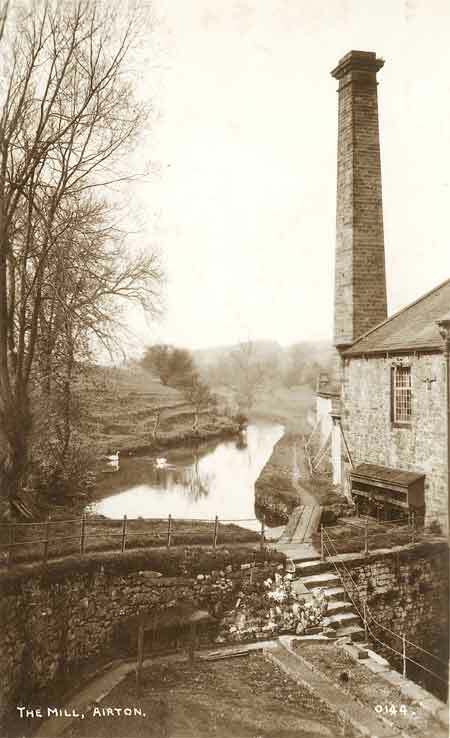 The mill supplied gas to the village, mainly for lighting, but as the company were also were also electrical engineers, they installed an electric generator driven by the waterwheel, which supplied the first electric lighting to the village, this led to an unique private lighting company being formed to provide street lighting in Airton. See our Hydroelectricity in Malhamdale page for more information. During the depression of the 1930s they went bankrupt and the mill was subsequently sold to Craven Freeholds, who later resold it to John and Thomas Blackett who farmed at Scosthrop. In 1942 Reckitt & Coleman bought the mill and moved their Dettol disinfectant production from their fire damaged factory in the heavily bombed Hull area, to the peace of Airton. During the war there was at least one accident when phenol leaked into the river killing all the fish. Rob Foster recalls that his family collected some of these dead fish and even after soaking them in clean water in a bath for a few days, they still tasted of Dettol when cooked, so they were boiled up and fed to the animals! Later the company used the mill for storage. Its final use as an industrial building came in 1960, when the mill came into the hands of the Sharp family who used it for their poultry breeding business based at Skellands, and in 1972 it was sold for the last time as one unit, to be converted into housing. Yorkshire Cotton by George Ingle, Carnegie Publishing, Preston, 1997. A History of Airton Mill by William Sharp, privately published, Airton, 1990.